Stationery | Welcome to Japan! I would like to introduce 2 very popular Japanese stencils. 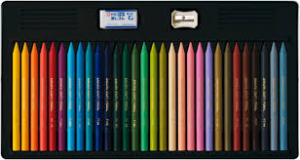 This is like a hybrid of crayon and color pencil. It is woodless but does not melt easily like crayon. It uses a combination of pure pigment and polythene wax. These pencils are strong and break resistant, making them ideal for use by not only younger children but many designer, artists and architects use them for drafting. There are 12, 18, 24 as well as 36 colors package. 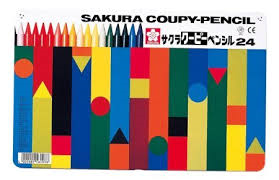 Each package includes Coupy Pencil and eraser as well as Pencil sharpener. They are very popular now in Japan. This can be erased in spite of the ballpoint pen. The secret of these pens are that the chemicals they use. 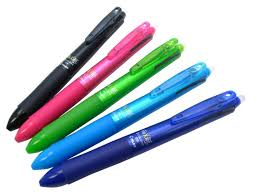 They use three different chemicals, and they become color less when heated by rubber eraser. Therefore, when the document is in the cold place like a refrigerator, words appear again. Therefore, they cannot be used for formal documentation. 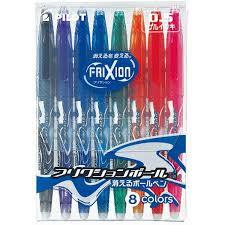 It is used by business people as well as many students since there are varieties of colors. Refills are offered for all colors, so they are eco-friendly. Once you start using them, you cannot leave it.